Economic globalization requires data to be available globally. With most data stored in file systems, solutions to make this data globally available become more important. Files that are in file systems can be protected or shared by replicating these files to another file system that is in a remote location. The remote location might be just around the corner or in a different country. Therefore, the techniques that are used to protect and share files must account for long distances and slow and unreliable wide area network (WAN) connections. IBM® Spectrum Scale is a scalable clustered file system that can be used to store all kinds of unstructured data. It provides open data access by way of Network File System (NFS); Server Message Block (SMB); POSIX Object Storage APIs, such as S3 and OpenStack Swift; and the Hadoop Distributed File System (HDFS) for accessing and sharing data. The IBM Aspera® file transfer solution (IBM Aspera Sync) provides predictable and reliable data transfer across large distance for small and large files. The combination of both can be used for global sharing and protection of data. 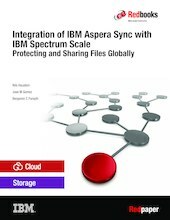 This IBM Redpaper™ publication describes how IBM Aspera Sync can be used to protect and share data that is stored in IBM Spectrum™ Scale file systems across large distances of several hundred to thousands of miles. We also explain the integration of IBM Aspera Sync with IBM Spectrum Scale™ and differentiate it from solutions that are built into IBM Spectrum Scale for protection and sharing. We also describe different use cases for IBM Aspera Sync with IBM Spectrum Scale.